The Rev. Dr. Beauty R. Maenzanise, dean of the theology faculty at Africa University in Zimbabwe and Emory University’s 2010-2011 Alonzo L. McDonald Family Chair in the Study of Jesus and Culture, will give the first of two McDonald Lectures on Nov. 18 at 4:30 p.m. in Cannon Chapel on Emory’s campus. Maezanise will address "Towards an African Theology of Mission: A Case Study of Zimbabwe United Methodist Church." The lecture is free and open to the public. 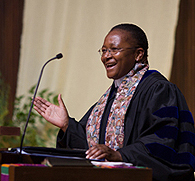 As the McDonald chair, Maenzanise will teach one course at Emory’s Candler School of Theology during the spring semester, as well as give two public lectures and preach in chapel services. Maenzanise is known as a leader in theological education, especially in The United Methodist Church worldwide. She holds Ph.D. and M.Phi. degrees in liturgical studies from Caspersen School of Graduate Studies, Drew University. She also holds master of sacred theology and master of divinity degrees from Drew Theological Seminary. Maenzanise is a perfect fit for Candler, says the school’s dean, Jan Love. "The McDonald Family Chair has been held in previous years by scholars from the United States. During Candler's year of internationalization, which began in January 2010, I thought it was important to invite a scholar from another continent to hold this chair," says Love. "Beauty is deeply committed to educating African leaders for congregations and educational institutions across the continent," Love says, "and I am very proud that Candler is partnering with Africa University in fulfilling this great mission." Prior to being named dean at Africa University, Maenzanise served there as acting dean of the theology faculty and lecturer. She also has been Carpenter Visiting Professor for Liturgics at Lancaster Theological Seminary. She currently serves as a member of The United Methodist Church Committee on Faith and Order. Maenzanise says she is honored to be the McDonald chair and is looking forward to learning from Candler’s faculty, administration and students while here. "This is an opportunity I have been dreaming of since I completed my doctoral studies. Candler has opened that door for me," she says. "I hope that my being here gives students and faculty a chance to learn more about other cultures, and Southern African culture in particular, and to learn more about and appreciate each other." In addition to her lectures and teaching, Maenzanise will focus much of her energy on writing and finishing a book on African Christian Worship. For more information contact candleralum@emory.edu. Past holders of the McDonald chair include historian Jaroslav Pelikan; Judge John T. Noonan of the U.S. Court of Appeals for the Ninth Circuit; composer Alice Parker; art historian Herbert Kessler; and author, historian and documentary filmmaker Randall Balmer, among others. Candler School of Theology, Emory University, is an intellectually vital, internationally distinguished, and intentionally diverse university-based school of theology. Its mission is to educate faithful and creative leaders for the church's ministries in the world. Candler is dedicated to expanding knowledge of religion and theology, deepening spiritual life, strengthening the public witness of the churches, and building upon the breadth of Christian traditions, particularly the Wesleyan heritage, for the positive transformation of church and world. It is one of 13 United Methodist Church seminaries, with an enrollment of 500 students representing 50 denominations and more than 7,000 alumni worldwide.